As well as being a national treasure in its own right, the Rijksmuseum’s internationally revered collection features some of the most famous national treasures in Amsterdam and the Netherlands, including historic art by Vermeer, Frans Hals, and perhaps most notably Rembrandt’s ‘The Night Watch’, which takes pride of place in a beautifully lit hall allowing visitors to enjoy every tiny detail. 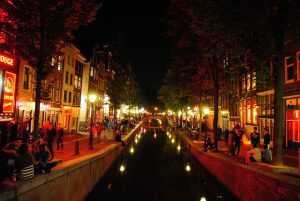 Learn more about Rembrandt in Amsterdam. 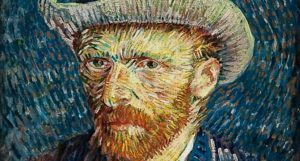 Visitors to the Rijksmuseum in Amsterdam can expect much more than just paintings by Dutch Masters from the Golden Age. The museum’s expansive, evocative collection also includes Delftware, sculptures, archaeological artefacts, clothing, Asian art, prints, items from Dutch maritime history and many other culturally significant objects, all combining to vividly explore 800 years of Dutch history within a global context. And naturally, the collection isn’t frozen in time – new items arrive to represent modern times, too, such as a Mondrian-inspired dress by Yves Saint Laurent dating from 1965. 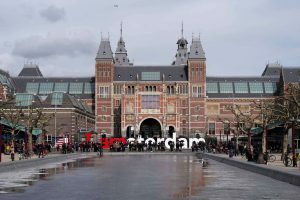 The Rijksmuseum’s present home on the city’s Museumplein (Museum Square) was designed by renowned Dutch architect P.J.H. Cuypers – construction of the monumental building began in 1876 and it finally opened in 1885 as the largest museum in the Netherlands. 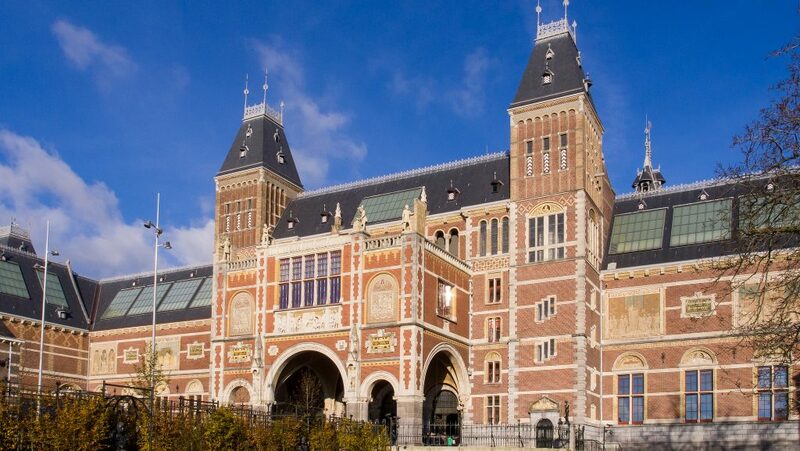 Following 10 years of extensive restoration and renovation, the Rijksmuseum reopened in April 2013 to worldwide acclaim. And in 2014 the museum expanded yet further with the opening of the redeveloped Philips Wing, ensuring that the Rijksmuseum is one of the most modern ‘old’ museums in the world. As well as a dazzling permanent collection that can take days to fully enjoy, the Rijksmuseum frequently hosts some of the biggest blockbuster exhibitions in Amsterdam.The museum also regularly hosts guided tours, lectures and other special events – check the Rijksmuseum website for the latest information about special activities.